Why do we enjoy family swim so much? For one, I enjoy it because I cannot stand getting into cold water with the kids. Yes, even in the summer. Hey, I never said I was the perfect parent! I'm a huge baby and even in the hottest of temperatures I bristle against the cold water in most pools. I am pretty sure if it weren't for the warm temperature at Goldfish Swim School, my children wouldn't even know that family swim was an option. And third, every week at the end of class, the teacher always talks about the skills that the kids are struggling with or need to improve upon. What better place than family swim to become a part of the process and help your own child overcome whatever swim obstacle they are working through? 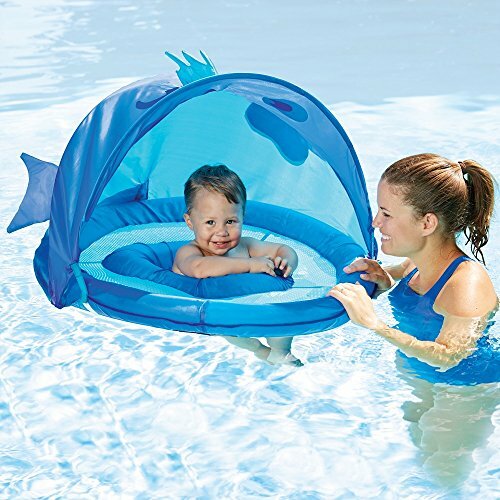 Or if your child still deals with water confidence, being able to play freely with the security of their parents also being in the water is a great step towards moving past that stage. And for those of you with large families, I have successfully taken all three kids to family swim, alone, on many occasions. The oldest, who is level Glider 3, has the appropriate confidence and swim level to navigate the water relatively freely. (Still within my eyesight of course). I keep the younger two in lifejackets to ensure their safety. Originally the very youngest stayed in one of those water saucers for babies before she outgrew it. Luckily Goldfish has a bin of lifejackets in all sizes, including infant, for us to use. So feel free to bring your own life jackets, arm floaties, water saucers, diving toys, etc. But also keep in mind that you are allowed to use most of Goldfish's stocked items in the water as well! I encourage all you readers to use family swim as a way to witness and encourage your childs swim progress, help them improve their skills, and most importantly, bond as a family! Family swim is free to members during their weekday afternoon hours, and 5$ with a max of 15$ / family on Friday evenings. Family swim is first come, first serve, so make sure to arrive on time / early to ensure they don't exceed the guest limit in the pool. P.S. Construction is nearly complete for the newest Goldfish Swim School location in Lewis Center! Lessons will begin July 9th so if this location is near you, make sure to call and register!